Bleeding Tissue Paper Art - C.R.A.F.T. The Art of Giving is one of my favorite events of the year, and by far the most creative fundraiser idea I’ve ever seen. This was my 4th year to participate as an artist, but my first year to chair the event with Andy! 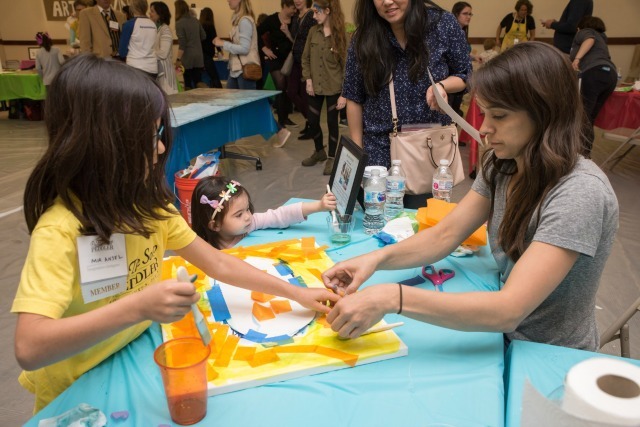 The actual event was April 8, 2018 and we raised $100,ooo for art and music therapy for Dell Children’s Hospital. 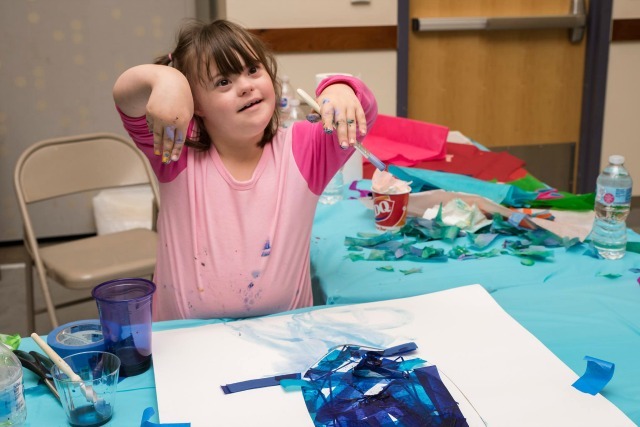 Twelve local artists, patients at the hospital, and kids from the community collaborate to make art and a local business sponsors each piece. 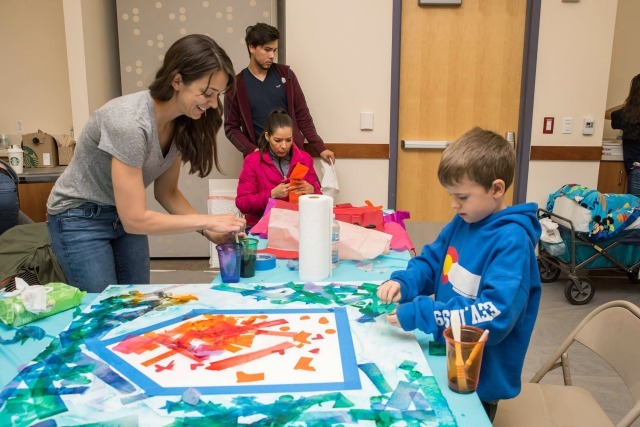 I love that the Art of Giving not only supports a cause that I believe in whole heartily, but also gets kids involved in giving back to their communities. This year, I decided to create a large scale bleeding tissue paper art peice! 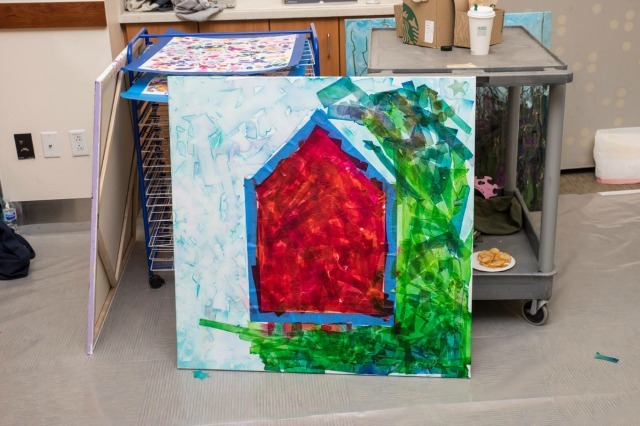 I chose to do a house shaped collaborative art peice because going home is a big theme at the children’s hospital, for obvious reasons. I also knew a house shape would be super easy to block off with painters tape. In theory you could block off any shape with painters tape. You could also consider using stickers or adhesive vinyl to block off a design too. 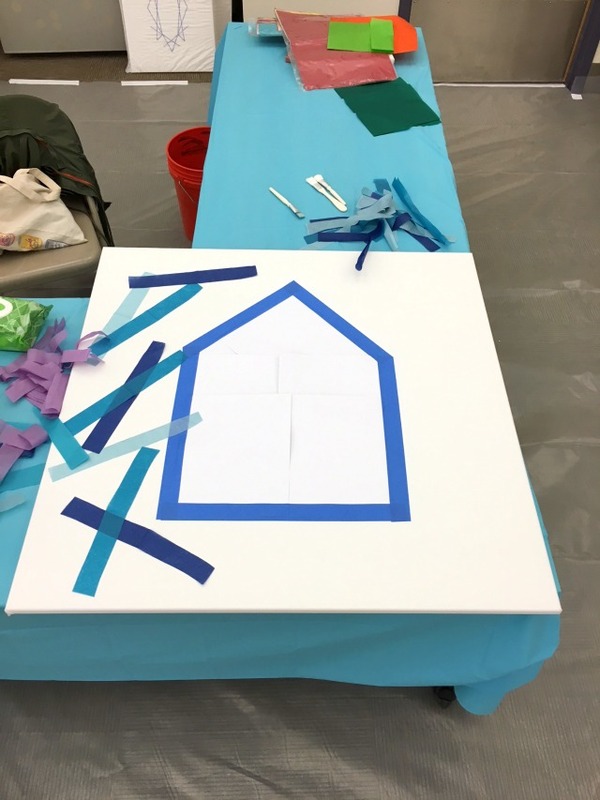 Before the event, use painters tape to block off a large house shape in the middle of the canvas. I added card stock to the middle of the house to completely block off that section while the kids worked on the outside of the house. Cut the tissue paper into long strips. Also, decide what color combinations you want to use. I decided to go with warm colors inside of the house and cool colors outside of the house. I prepped some strips, but I also let kids cut strips and shapes at the event. For a totally different effect, you could do a bleeding tissue paper peice with circles, squares, and triangles. This is where it gets fun! 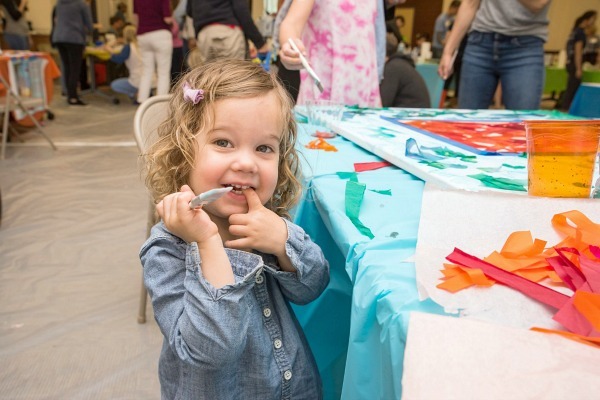 Once the canvas is set up and at least a few tissue paper strips are cut, let the kids go wild painting tissue paper strips to the canvas with water. I set out 3 plastic cups filled with about 2 inches of water and 1 paintbrush per cup of water. This allows me to control the amount of kids that can work on the peice of art at once. Kids come and go as they please, some kids will stay for 3o minutes, while others will only paint one tissue paper strip and move on. There is no wrong way to paint on a stip. Lay one strip on the canvas, fill the paintbrush with water and paint the strip to the canvas. It’s that easy! If you’re doing this as a collaborative art peice with tons of kids, I recommend doing one section at a time. For our collaborative house peice, I had the kids work on the blue sky section outside of the house first. Then, after the sky was complete, I removed the inner card stock house, and we worked on the inside of the art peice. The tissue paper strips will dry and peel off very easily when they are ready. 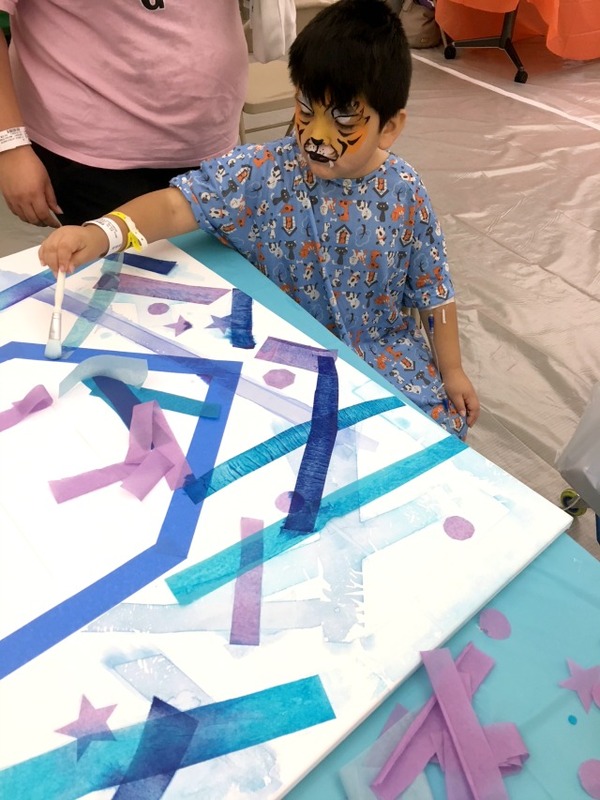 The end effect will vary depending on how much water is used and how many layers of tissue paper you allow the kids to paint on to the canvas. If you notice, the center of the house was really wet and covered in many layers of tissue paper, this made for a more blurred water color effect. Versus how you can see more of the actual strips in the blue section of the art peice. Once the canvas is complete dry, I recommend spraying it with a clear spray polyurethane. This will ensure the color stays put. For the 2018 Art of Giving, I made 4 collaborative art pieces with the kids. 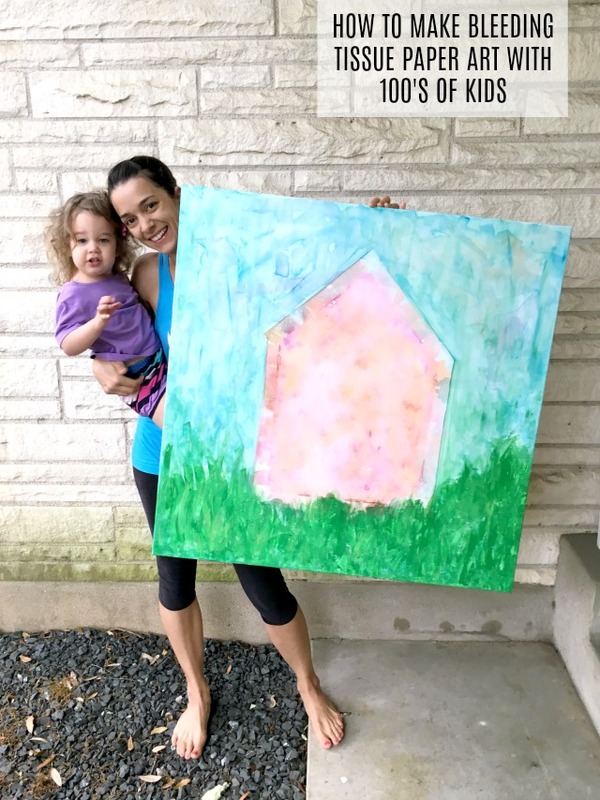 I made the big 3 foot x 3 foot house canvas, but we also made 3 other bleeding tissue paper art pieces. The one below was made specifically for Kendra Scott. This sweet little girl did most of the work on this one! I love that bleeding tissue paper works well for all ages and skill levels. Even my 2 year old enjoyed helping us with this art peice! It’s also fair to note, that I added the grass at the bottom of the collaborative art peice after the event. I used multiple shades of green acrylic paint. I felt like the house needed to be grounded. If I did this exact project again, I would likely position the house at the bottom of the canvas. Have you ever used bleeding tissue paper? I feel like it is such an under utilized art material!